We woke this morning to rain the first time since we left home so I guess we can’t complain. It took some time for both of us to make a move out of bed but the call of nature prevailed so we had no choice. We are quite adept now at packing up and taking the tent down. Today was a new lesson as we had work and stay inside to avoid a soaking. First the contents of the living quarters deflated and everything packed and put away in the right place. Next take the inner living quarters down without touching any of the walls or roof to avoid getting it wet - job completed. Now with a decent area to move freely and dry we continued to have breakfast and later continued packing everything away, leaving the sopping wet outer shell to be folded up last. This is now in the shower enclosure of our B&B tonight drying out…. All gear packed away we set off leaving at a leisurely 10am but before the end the village we were both donning our waterproofs. For me it was a case of take them off before passing out with heat exhaustion, put them on, take them off put them on…….you get the idea! The day was a leisurely one walking through nice open fields and lovely woods but as we both left Ketton the skies started to get darker and darker with the distant rumble of thunder not too far away. We departed as usual with a kiss, thankfully it wasn’t the last but neither of us knew what the weather had in store for us. For Rachel, cycling to Duddington the next village where we would meet, the sudden storm just meant she had to stop and put waterproofs on. For me it was a bit more of nightmare…..
After I left Rachel I crossed into the fields with the distant rumble of thunder getting closer and closer and the sky getting darker and darker, I quickly slipped into my waterproof trousers and jacket before the sky unleashed itself with fury. No problem, I have walked in worse. Then the thunder started and that’s when it got a bit hairy as it passed directly overhead. As I reached the middle of the field there was an almighty crack of lightening also directly overhead. my thoughts being where is the best place to shelter from the lightening?…….well it did not matter I had no where to go but had to continue. My imagination took over, I was walking through a field with lightening carrying two metal walking poles like lightening conductors in my rucksack….not ideal! Thankfully I live to tell the tale but it was pretty scary and an experience I would rather not repeat too soon. We met up again in Duddington and sheltered in a bus shelter strewn with bird poo all over the floor to have our lunch, beggars can’t be choosers! Later we adjourned to the Royal Oak Hotel for warm drinks and swift half for me. After an hour we dragged ourselves out for the last leg to our digs tonight in Kings Cliffe. There is a campsite not too far away which I pass in the morning but it has no permit for tents and despite asking does not even have a shed we can use. So with the wild camping becoming harder to conquer we are ensconced at Rose Cottage a 500yr old house..nice! O and it has a bath too…….guess where Tony will head to first? Well, the previous night’s wild camping expectation did not disappoint. It wasn’t really a nice thought not knowing where we would lay our heads that night, and was stressful finding somewhere ( repeat asking random dog walking villagers, + pub bar staff for use of grass at rear of establishment, or if they know of any friendly villagers or farmers, with the answer being a resounding ‘ no’ ). We wandered through Swayfield in the late evening feeling like lepers, when I spotted a lovely flat lawn at the front of a house that was clearly being renovated. There was movement from behind the hedge. I dared put my head beyond the gate entrance to see a bare chested young man with hedge trimmer in hand. I smiled sweetly at him and gave him the spiel…..long distance walk, come a cropper for accommodation, tent, self sufficient, on your lawn ? To my absolute delight he welcomed us ! I phoned Tony ( who was hiding down yonder lane in case the hedge trimmer was used to chase us away - he would need a head start without bike ), to inform him that I had secured a flat, safe, and legal piece of lawn for us to sleep on that night. The only request from our new best friend was that we were away for 7 am, as he was going to work then and preferred us to be away by then too. We dutifully set our alarms for 5 am, and were gone by 6. When I say gone, I mean we sleepily got ourselves to a bench at the side of the road just round the corner and set up stove in order to cook porridge + tea for breakfast ( see photo ). Thank you ? for letting us sleep on your lawn - a true Samaritan. Tony’s walk during Thursday was a pleasant and relaxing one. He wasn't very happy, however, that his newly washed and clean shorts were yet again very quickly stained by the pea / bean plants that he had to wade / struggle through again today. His legs were also again regularly whipped and strangled by misc binding type plants and nettles. It was another very hot and sunny day. Tony has worn his sun-hat everyday whilst walking. I have worn my bike helmet everyday too. Nina, my hairdresser would be so disappointed if she knew. We had a lovely rest stop at Pickworth, Lincolnshire. It is hard to believe that over 200 people used to live in the village and had a pub until it fell into decline. Now it seeing a resurgence with 70 people living there now. We arrived at Road End Camp Site, Great Casterton, a basic campsite - well there is basic and basic. No hot water, no plugs for the sinks and no dishwashing facilities. Lesson for today: Carry spare sink plugs - they weigh ‘nowt! I cycled to and from Waitrose ( such a treat ! ) at Stamford ( a very nice market town with many very well spoken school children walking from school bus to town ) for some much needed provisions. We ended the evening at the pub close to the campsite, where we plugged and charged no less than 4 appliances. Rachel has continued as the support vehicle negotiating a few hills today that have been walked up due to the weight of the panniers - no incidents. 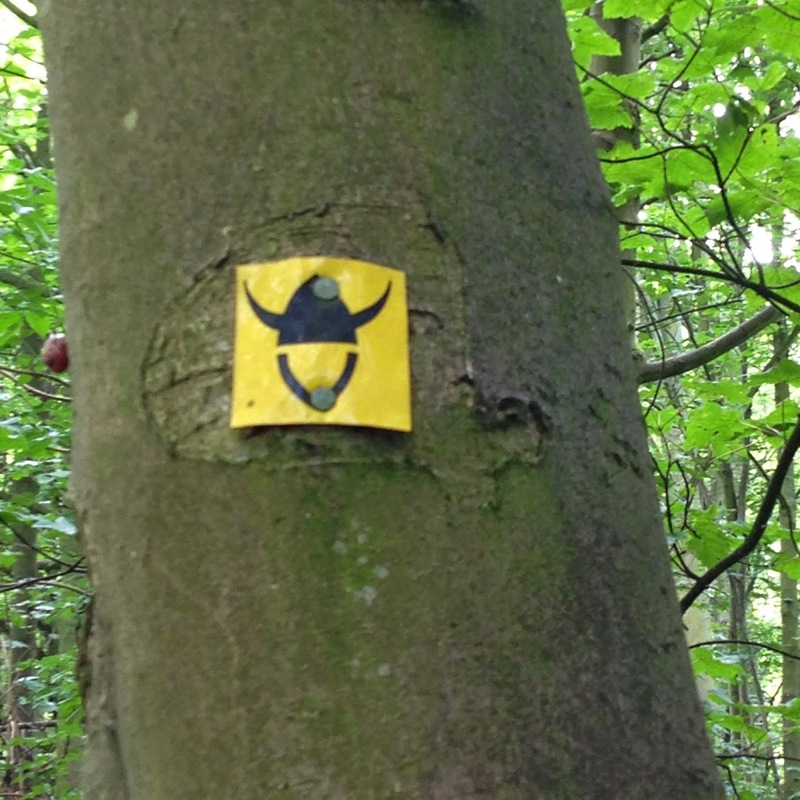 Today has been a wonderful day travelling along the Viking Way and the Drift an SSI nature site. This brought me out to Saltby Airfield which played a vital role in the D-Day landings parachuting units to the Cherbourg peninsula. Later that year Operation Market Garden flying to Arnhem. The Buckminster Gliding club now use the site and were instrumental in the dedication boards to the previous history of the site. After leaving the Drift I spent the rest of the day travelling sometimes very slowly across fields of crops - pea fields being the absolute pain in the bottom - see photo. Other instances saw official footpaths either not marked, gates locked to stop direct access, barbed wire fences where paths should be, needless to say this will be raised with the respective district council to action. It makes you wish you could carry some bolt cutters and a pot of yellow paint to put things right! A big thank you to the National Trust person at Woolsthorpe Manor who let us use the cafe without paying an admission charge into the site. The other highlight being crossing the A1 without becoming strawberry jam, yes the path does officially cross it. I waited for a gap in the traffic both sides and ran across like my bottom was on fire jumping across the central reservation like Red Rum or Shergar!! We were going to stop at Burton le Coggles owned by the Chummley family but chose to carry on and do a few extra miles due to the shorter day yesterday. Now we are at Swayfield and will be wild camping tonight - Rachel is now a firm fan of this now…….not, after the Bovine incident. We have identified a site again near the church so fingers crossed for a peaceful night. We will let you know how it went. We set off from the campsite in the usual fashion - slowly, both of us just warming up into our respective means of transport. We were heading for an ‘ Airbnb ‘ ( website where households have a room that they want to rent out advertise, and bed / room seekers search and find ) room at Hungerton ( ‘ Room in the Middle of Nowhere’ ). We had camped for 4 days in a row and were very much looking forward to a solid roof being over our head, the added benefit of not having to erect the tent in order to sleep, plus the luxury of a bath at our disposal ! The route took us both up and down quite a few hills again. Weather was muggy, with 2 heavy rain showers. We hoped that the rain showers would lessen the mugginess, but it was not to be. We arrived at Hungerton mid afternoon, and were greeted very warmly by our hosts. We’re sat here still, in a lovely country kitchen with ‘stenders on in the background chit chatting with some lovely people. Having done some research on the next few days walking routes and possible campsites / accommodation options it looks like ‘wild camping’ is on the cards again ….moooooooo!! We arrived at Belvoir ( pronounced Beever ) Campsite the evening before. We were very pleased at the prospect of spending 2 nights at this site ie the day between was to be our first rest day. We established that we needed a few essential items to be able to live comfortably ( ! ? ) for the next day or so, including a gas canister for our new spider stove, have I mentioned this before ? The campsite was basic - no hot showers there yet but are in the pipeline….but plenty of hot water. On the morning of the Rest Day, I rose early so that I could cycle to Grantham to purchase our necessary items with the idea of returning later that morning and then have the whole of the afternoon to chillax. I allowed Tony a lie-in but he was up shortly after I left. I set off with my mini shopping list and bags for purchased provisions. Rather than the 20 mins to cycle the 6 miles ( road sign distance ) it took me 1.5 hours to reach Grantham via hilly country roads plus the canal tow path in order to avoid yet more hills. Necessary items were purchased, I returned via the same route and arrived back at site at 2.30 pm. I was slightly miffed that my wee jaunt had taken all but 5 hours ( almost solid cycling ), but was pleased to get back and do nothing for the rest of the day. ‘Nothing’ consisted of us writing blog, writing walk notes for the last 10 days, doing research on accommodation / sites for coming days, doing the obligatory emptying mini-ruck sack + cycle bag x 2 content all over the grass, moving it around and re-packing - very satisfying indeed. No bull, but nettle soup anyone ? We had our breakfast on the hard standing behind the Italian Restaurant at Gunthorpe - 2 boiled eggs each, porridge and black tea. We saved the other 1 x boiled egg each for lunch. We half expected to find a lovely campsite at the other side of the canal as we walked along it at the start of our day, just so that we could see what could have been the night before, but there really was nothing. We felt pleased in a very small way about our final sleeping place of the night before. We cycled + walked as had become routine. As I cycled it became clear that there was a local cycling event taking place on the minor roads that I was on - both a 50 + 100 miler, I declined both. Periodic batches of cyclists overtook me. I’m sure they will have been sniggering at me weaving and wobbling going very slowly whenever there was a slight incline, or pothole, or drain in the road due to the weight of the panniers and my rucksack load. the rest of the days!! Bovine incident 2: As I neared the village of Grandby where we had agreed to meet and just three fields away I had to pass to the right of farm buildings. The first stile was a doddle, only baby nettles there. The second, I think they knew I was en-route and they had grown to above knee height. My routine now was to suss the blighters out - stare at them hard and then advance. Identifying the attack point, with left boot (sock pulled up well) squash with a slight left of path action - advance carefully and repeat with the right boot, and so on. In the previous encounters some had crept up behind me to whip on the back of the leg - ooooooo that smarts! Or words to that effect - well it is a family blog!! Stile three was a non starter - Hawthorn hedge about eight inches above the stile so like a gazelle on speed carrying two more gazelles on my shoulders I vaulted the fence - poetic licence there. Now I had a swamp of nettles ahead of me to wade through - ha ha I knew what to do here. Rucksack down and Leki pole out and thrash the buggers down like Indiana Jones and his whip action. Safe, now where is does the path go? After looking at the map, checking GPS I had to turn left past a fence line and an agricultural building - I looked up from the map knowing I was being watched - and yes Bovine number 2, but not just any Bovine, a great big brown bull with two very sharp horns glinting in the sun. It was a stand off, who was going first as I knew he knew we both wanted to pass each other. Just then my phone rang and I am not sure who was more startled me or the bull, on hearing it he leapt up and started moving around, I think he was unsure whether to answer it or not. And then if being tramppled by a bull was not enough, as I crept round the fence I was greeted by two bullocks a flipping big cow all going bonkers as my mobile continued to ring. "Hello darling! Are you nearly here”? "Well sort of, trying to remain calm. " "Where are you and how long will you be”? "Well it's like this, there is a bit of a stand between two bullocks, a big cow …….o and a bull with big horns"
" Don’t worry it will be ok but I might get eaten again……"
Needless to say I did survive, but O if Rachel had have been there…….well she wasn’t thank goodness, and I lived to tell this tale..
Today the sun shone into our tent as we woke up as it had done every morning so far - how lucky are we. Each day we have been applying suntan cream, and each day we look like we live outdoors - which we of course do. Tony felt rather weary first thing, this being the start of the 5th walking day in a row ( rest day planned for after the 6th on this occasion ). During the day a change was made to the route so that the mileage was cut short so that Tony could rest. Our village of proposed campsite was Gunthorpe ( a name now etched in my mind… ). We had done some research and this showed that there were 2 campsites in the village. I cycled ahead to identify the best and to check-in. The first turned out to be a static caravan park which didn't accept campers, and the second was a pub with camping field behind that had changed hands - would the new owners allow campers ? We did see, though, that the lovely canal at Gunthorpe was very popular with fishermen and their ( all night ) tents. So, I cycled further down the tow path in order to find a quiet field ( away from the tatood fishermen and their beer crates ) where we could have another ‘ wild camp’. I found the perfect spot - a large field with low cut flat grass - perfect. I walked all round to ensure that there were no animals in sight, as there were quite a few fields interconnecting with open gates - there were no animals to be seen. We set up camp, very pleased with ourselves that we were such good adventurers. Then, all of a sudden 2 cow shaped silhouettes appeared in a gate space 2 fields away ! Horror of horrors, they were walking in our field’s direction and there were hundreds of them ( ok, maybe 15 ). As you can imagine, my adrenalin kicked in and I started frantically packing all misc items that were both inside and outside our erect tent and fumbled to find my bike lock key ( had locked bike to itself - thought it a good idea at the time ). Tony was elsewhere at this point ( behind a tree, not with fear but call of nature ) and he didn't seem to have any sense of urgency whatsoever ( he would regret this later ). In the meantime, the cows had spotted me and had decided to investigate. I managed to load all my bags onto the bike and wobble it erratically out of the field. I returned to the field to start taking the tent down, but Tony had done that and was holding it and all of his other worldly goods in his arms whilst pointing 2 x lekis directly at the cows who were by now within feet of him. Tony was making loud noises like they say you should to make cows move away, but hadn't decided whether to move left or right to get out of the field ( he was between long hedge field boundary and cows ). It seemed like fear had got to Tony too ! I braved a foot into the field and also did a loud shout so as to make cows move a bit further away so that Tony could come towards me to exit the cow’s territory. He managed to come to me in a very controlled walking pace - goodness I couldn't have done that ! So, we were out of cow hell, but now had no abode for the evening and it was 8.30 pm. We went to the pub who’s predecessor allowed camping in the field at the rear, and the man at Portolini Italian Restaurant, he say yes ! ( and charges £10 for a square of grass with no toilet facilities ). We were simply grateful to have a patch of legal and animal free ground on which to lay our weary bodies. We are pretty much in the routine now of checking road ( Rachel ) + walking ( Tony ) maps first thing to establish meeting points where we can either have a goods / food transfer from Rachel to Tony, or exchange simple pleasantries with a wee kiss, or to sit down and have lunch. Where a bike can go along a walking / bridle route then I either ride just in front of Tony acting as a pacer ( ! ) or I walk alongside him in order to give my now pretty well healed shin splint muscle some strengthening exercise. Where a bike can’t go where a man can, then my roads are a combination of ( usually quiet ) country lanes and busier more main roads that I can’t avoid. Today was combination of all of the above ( stopping points and types of road / paths ). We headed for New Hall Farm camp site and arrived at our destination separately. We had both walked ( yes I walked and pushed bike ) up a very big hill to reach the camp site which was situated on the brow of said hill with views all around - beautiful. We were made very welcome here by a young farmer and his farmer father who were very interested in our journey. The evening was very pleasant with our now staple noodle + misc veg + chopped toms + cheese meal, but this time had pudding - a Bounty + ice-cream ! I slept like a baby, but Tony woke to sounds of what sounded like a ritual sacrifice happening in one of the valleys below, with bongo drums and singing - it was ‘ Mo-Fest’ a local music festival that was being held that night in a field owned by a farmer called Mo. After a Costa Coffee and M&S sandwiches bought to charge Tony’s phone and use the free wi-fi, we headed off for Wellow, and our destination B&B ( hooray ! ). The day was half together travel, and half not. Quite a chunk was through Nottingham Forest / Clumber Park which was a change from the open fields and big skies that we have had the last few days. At Hardwick Village in Clumber Park ( National Trust ) Tony asked me to suss out the Visitor Attraction Centre for coffee or such like. I cycled down a very big hill and found a caravan near some lakes that was selling quality coffee and teas. I then cycled + pushed the bike back up the aforementioned very big hill to report back to Tony ( no phone signal ). In the meantime Tony had dawdled just a few hundred yards down a minor slope and had found the very same caravan from the other side. Feeling used and abused ( well, not quite ) I took comfort in the fact that I was becoming more like Lizzie Armistead with every hour. Althougth we had been advised that that there was no suitable campsite for us in the area, Tony walked past Walesby Forest International Scout Activity Centre - obviously wasn't meant to be. The Maypole Boutique Hotel at Wellow was ! Rain did show itself during the afternoon in the form of heavy drizzle - not enough to moan about so we were thankful. Also a big thank you to Wendy (the other church warden ) and Chris who very kindly offered bathroom facilities after brekky - showers and cups of tea were also offered but we politely declined as we needed to press on. As we left the village to pick up the path for today we spied a nice quiet, secluded lush piece of grass - ideal for camping on !!! The rest of the day went pretty much to plan i.e. walking + cycling together where the paths permitted, or separately where not. 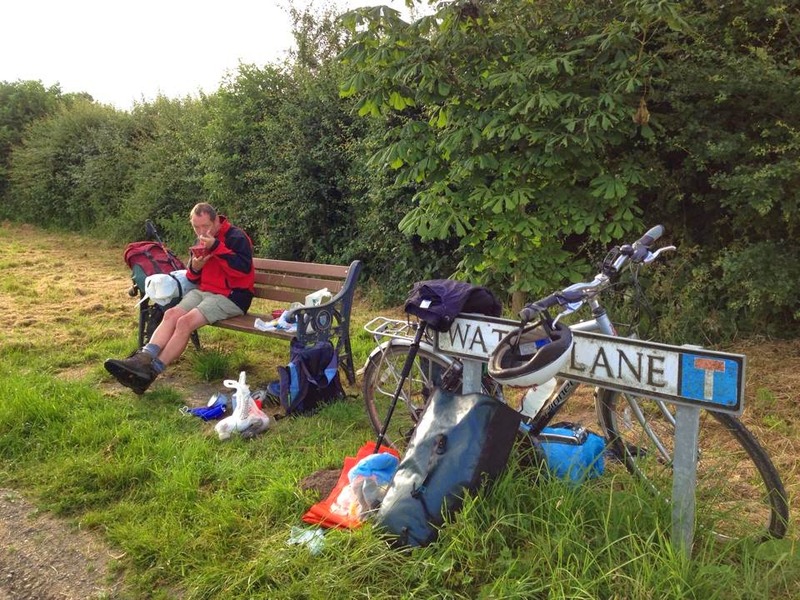 The last part of the route for the day was along a canal tow path that took us into Worksop. We were ( pre booked this time ! ) campsite bound for the evening on the south side of Worksop. After ( what seems to be becoming a regular thing ) missing the rectangular brown sign with tent and caravan on it we travelled approx 2 miles through Worksop housing estates before eventually finding our destination. 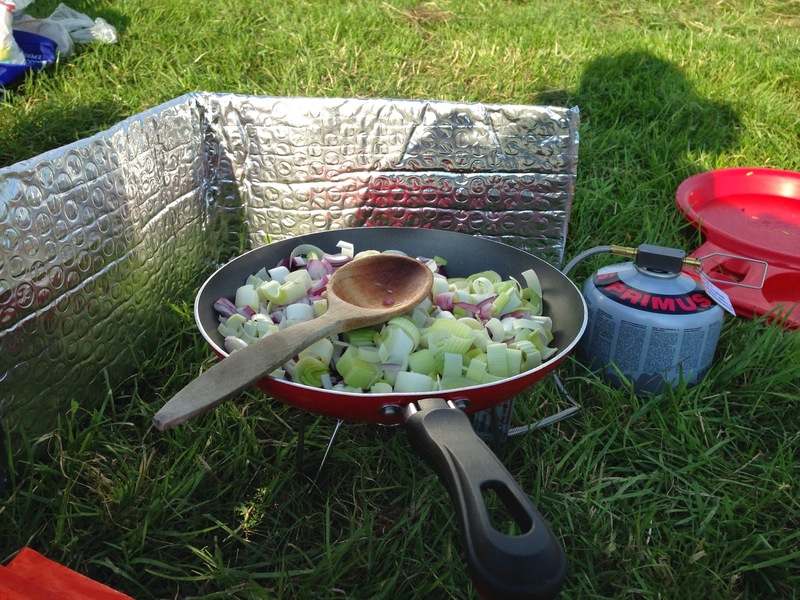 The evening was very pleasant with our first evening meal made on the new ‘ Spider Stove’. An early night was had. The day started well - we sorted out which stretches of the route I could cycle alongside Tony on and which roads I needed to take alone to then meet up with Tony later. This will be the routine for as long as I am on the bike. We left each other’s company at Conisbrough, and I started to climb ( on bike with heavy load ) a very long steep hill. I almost came to the top of it, and tried to change to the very last gear, but CLUNK CRUNCH - something went very wrong, I lost momentum, the bike started to list, I couldn't stop it, and I fell off with bike falling onto of me. Fortunately I fell onto a grassy bank so was not injured except for a left leg full of nettle stings. It was clear that the bike was no longer in working order as something was dangling off the back of the gear section that should not be dangling ( girl speak for ‘ the back mech. had sheared off’ ). I pushed said kaputt bike to the next parking bay at the top of the hill. Fortunately Tony was not far away and he tromped ( good word indicating that he was probably swearing under his breath ) over various fields to find me at the side of the road with bike upturned ( the right thing to do to inspect - right ? ) and luggage strewn on the side of the road. In the meantime a very kind cyclist had seen me out of action at the side of the road and informed that there was a very good bike shop about 5 miles away. To cut a long story short, I got a taxi ( we do like taxis ) to take me + bike to the bike shop and Tony walked there. Next challenge was to see that the bike shop was on Tuesdays. OMG - what to do. I asked a nearby lollypop lady about accommodation in the area so that we could be at the shop first thing in the morning, and while I was talking to her holding broken bike the bike shop owner ‘ just happened to be passing’ and called over to see if he could help. Nuff said - he opened his shop especially to fix my bike, and that he did and no charge for labour. It was repaired in half an hour after a cup of tea and some good chit chat - he totally made my / our day ! Name = Dave Marsh Cycles, Maltby. Now that bike, Tony ( who had caught up ) and I had our equilibrium back we pushed on to Roche Abbey near where we planned to do our first ‘ wild camp’. We were very excited. I went ahead to suss out any potential lovely grassy meadows with streams running alongside ( for bathing and foot dangling etc ) where we could spend the night. I found none, and none again. We went a bit further but still none - all were either excessively private ( with beware of the dog signs etc ) or were rocky agricultural fields - no good for our brand spanking new Tarptent - Stratospire ( google it ). We came upon the village of Firbeck. The pub had no rooms, no-one who heard me asking the barmaid if they knew anyone who might have a bit of field or garden that we could camp on came forward ( would you believe it ! ). We did however spot the church + graveyard ! Yes - we phoned the number on the church sign to ask permission to camp in the church grounds, and he said yes - hoorah ! It was a dead quiet night and the neighbours behaved. We had a very comfy and quiet ( ! ) first night ‘ wild camping’. Thank you to the warden who allowed this. 21 miles walked, but have to repeat some of this at a later date due to said interesting take on the day. Monday morning very much anticipated departure from home ( not to return for a good number of weeks ) was deferred to an evening departure. Certain tasks had to be completed before leaving the house, namely trying to complete the erection of a log cabin in our back garden which had been started only 2 days earlier - why was such a task even started with the impending departure looming I ask myself ( Rachel here, in case you didn't realise ! ) ? A very big thank you, however, to Tony ( and Ben - couldn't have managed without him ), as we now have a lovely outside office / garden room / expensive garden equipment storage facility / stable at the rear of our property. Since ‘ feckin shin splint’ day, we revised our plan - Tony was to walk and I was to cycle alongside-ish. We prepared accordingly. The evening train to Wombswell ( from near where we would start our next stretch of walk ) was taken, heading for the Holiday Inn. We arrived at Wombswell station, and Tony phoned for a taxi ( yes, walkers don't always like to walk ). Taxi arrived and set off, and I pedalled like billio to keep up and follow. The taxi driver very kindly pulled over every so often so that he didn't disappear out of my view. Both parties arrived at the Holiday Inn, and the very kind taxi driver allowed Tony’s journey to be ‘ on the house’ due to our story ( the big walk ) and due to the amusement of me chasing him by bike, which made his day. Eventually we left the urban sprawl of Wakefield to return to the Canal where we left off the day before. Today would see us following the Trans Pennine Trail and cycle route (62/67) past the canal into fields and wooded valleys. 12 miles being the planned day that would see us arrive at Barnsley to return home home on the train. Neither of us was in a particular rush and the pace was more leisurely and more sedate. As we entered the village of Heath with its village green and the old hall, we stopped for a short break where Rachel mentioned that one of her legs did not feel quite right, but if we took it steady would be ok.
We left the village and a few miles further skirted the old pit village of Walton, heading into the old colliery site that has now been transformed into a beautiful nature site. Sitting on the grass Rachel casually mentioned that her leg was not much better, in fact it might be swollen, in fact it might be a reoccurrence of a shin splint.
! @£$%^&*()_+ was heard in the air. "So we set off on Monday for nearly 12 weeks", we both said, how can we continue that? Well we are both cyclists too, so after some deliberation we discussed the feasibility of Rachel following me by bike - not literally, and it was decided that was how we were going to continue. One on foot and one on a bike......for as long as it takes. 8am outside Leeds station at the canal basin - so which way is it? Today we will follow the canal most of the way, it is a hot sunny day so plenty of suntan lotion applied, sunglasses on and sun hats at the ready! We followed the canal through the old industrial heritage of Leeds, past the old mills and warehouses that have either been converted to posh waterside apartments or modern office blocks. Some might say it's not what it used to be, but as we walk past one building that as laid dormant, empty and semi-derilict for the last twenty years - these relics of the past should be used. As we walked hand in hand, Tony doing most of the talking this time, we came to the end of the one of the canal boat resting spots. We turned right into another industrial estate and stopped. After much head scratching, GPS gazing to identify where we were, we retraced our steps and then saw the path off to the left. We continued past Thwaite Mill, now a museum until we left the canal at Woodlesford and onto tarmac......o how I just love tarmac! The sun shone and the day got hotter, Rachel asked how far the days walk was, I explained there was an option of heading to Outwood station to make the day shorter, this was greeted with a big smile. So Outwood station here come. In no time at all we arrived at the Stanley Ferry which brought back memories of Rachels' Grandma Rita and Grandma Maggie and the family gathering they had there. "O so that's where we are is it" Tony exclaimed - "I think we have gone too far!" I offered Rachel the choice, either carry onto Wakefield or we retrace our steps and walk to Outwood - not much in the distance. Lesson 3: Always have a catch point on your walk so you don't go further than you intend to. Suffice to say it was agreed that we return to the canal and follow this to the outskirts of Wakefield before making our way into the urban sprawl. After Tony having been made redundant recently, what better idea then than for me to leave my job too ! We have decided to take time out of the 9-5 (+) routine and pursue our long time love of walking by doing an extra long one from North Yorkshire to near Dijon, France. So far we have completed 7 days - only approx 90 to go before the boots are off and we can put our feet up ( at the luxury spa that I have in mind... ).